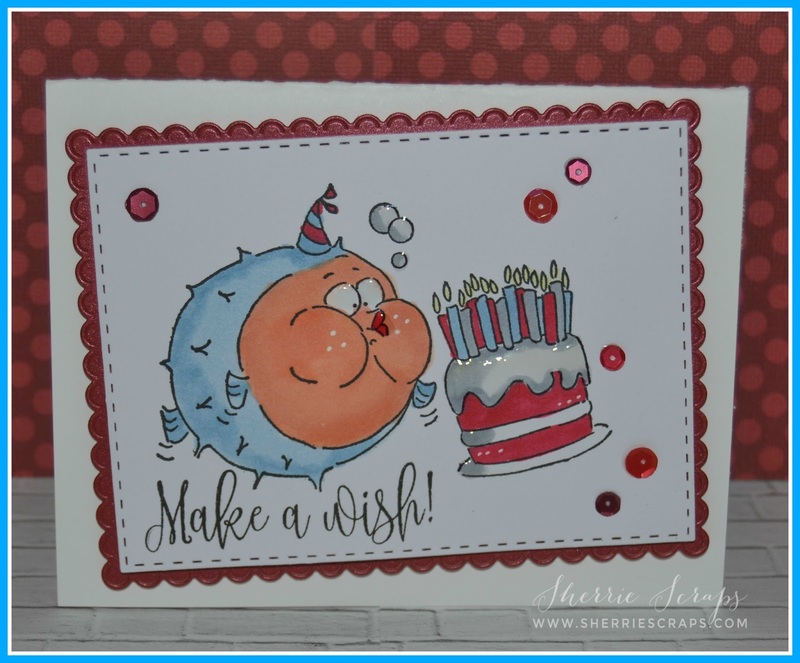 Sherrie Scraps with passion: Make a Wish!! I have a fun little birthday set using an adorable stamp set my sweet friend, Theresa at Theresa's Crafty Creations sent me for my birthday. Oh my gosh, I just love this puffy fish! Thanks so much Theresa! I made a couple of these set so when I just need a quick little something for someones birthday it's all set to go. The card base layer is Jaded Blossoms Scallop Rectangle Dies. I followed with Tutti Designs Stitched Nesting Rectangles. 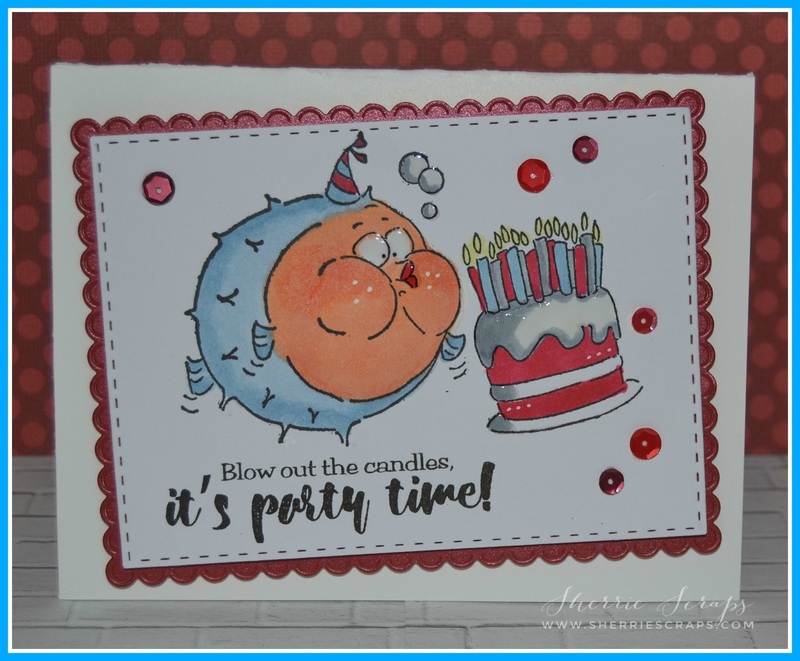 I stamped the sweet image from Art Impressions called Blow Fish and colored it with copics. I also added glossy accents to the eyes, lips and the cake frosting for a fun look. The sentiments are stamped with My Creative Times~Make A Wish stamp/die set. I finished with fun little sequins in my stash. The treat is created with My Creative Times Stitched Treat Sleeve Die. I then followed with a panel using the Stitched Square Die Inside and Out dies and the Pretty Edge die. I stamped the image, colored it and fussy cut it out. I added foam adhesives to add dimension. Then in the corner is My Creative Time's Stitched Starburst die and the Scallop & Stitched Circle die. I stamped the sentiment from Make A Wish onto that and adhered it in place. These are all as cute as can be! 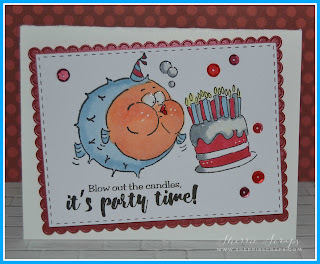 Love that blow fish image and you've colored him fabulously. 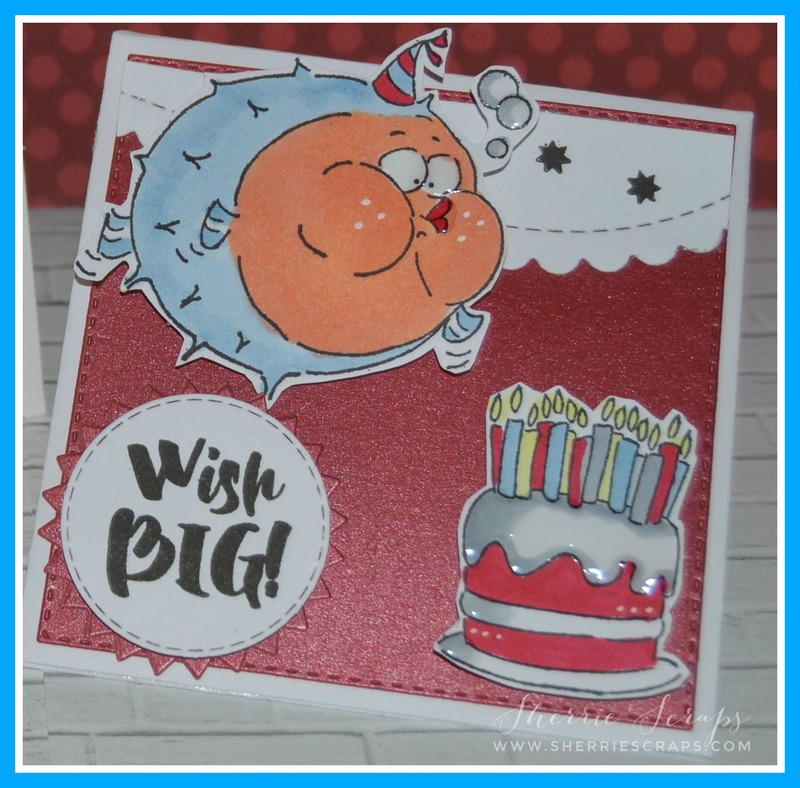 Oh my gosh, these are so darn cute, Sherrie!! That fish is absolutely adorable!! You colored them perfectly!! I love the cake and the sequins!! Festive and so fun!! Love, love these!! Thanks so much for playing along at DL.ART!! Adorable projects! That fish is the cutest thing ever! Your coloring looks so amazing! I'm sure the recipients will love these! Adorable!! love the puffy fish!! Wow! That fish is super cute! Great cards! Wow! These are each so adorable! I love them all! Thanks for playing along with us at DL.ART Challenges! What an absolutely fun image and your coloring makes it even cuter! 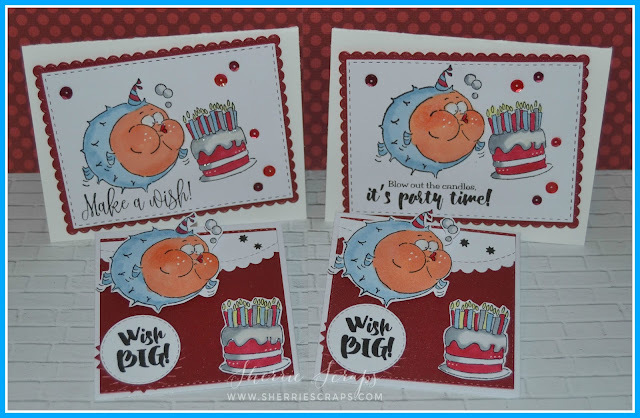 Love these fun cards--they definitely bring a smile. So glad you joined the challenge at Jo's Scrap Shack this week. He-he how cute! Love that cute little blow-fish, I also remember catching one before too! OMWORD Sherrie!!! They all turned out soooo stinkin' ADORABLE!!! Your coloring looks awesome and the cards are so FUN! I love the treats as well... I'm so glad you like the stamp and are getting some use out of it! YAY!!!! Makes me HAPPY to see you crafting! :) Hope all is well with your family! BIG HUGS!!! These are sooooooooooooo cute! LOVING those fish!!!!!!!!!!!!!!! Sooo adorable! 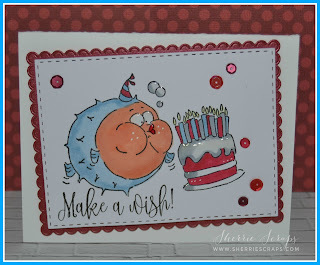 Those puffer fish are just making me smile! Fun set of cards and treat holders Sherrie. I love the glossy accents. These cards will make someones day they are so darn cute. So cute!! What a sweet gift to receive - you've certainly put it to good use! Oh how cute! Love that Puffy Fish. Just Adorable! Love the added Sequins. Happy birthday to you! This is a super cute stamp set what a sweet friend. Love the cards they turned out so cute! Love the super cute stamp! Theresa is so sweet! !The birthday cards are super cute!The treats are super fun! Oh! you did such a cool job on coloring!! Oh my! That fish is way too fun! Oh how fun! What a cute image and your coloring looks awesome. 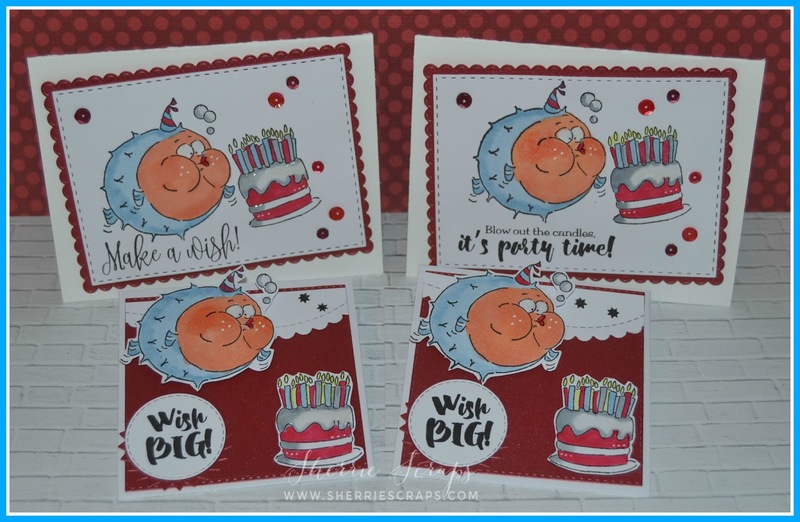 Theresa is such a sweet friend and I know you had a great time making these adorable cards.